I like when desserts pairings seem to naturally fall into place. I purchased some small Barlett pears the other day from Kensington Market, so I decided to poach them with half a bottle of Riesling that I had left over from the night before. I have been wanting to make Pierre Hermé's chocolate rice pudding with caramelized rice crispies for some time now, and since I had a bunch of left over chocolate from my chocolate ginger brownies and chocolate pudding, I thought that it might be a good opportunity. I like when I have everything on hand at home. 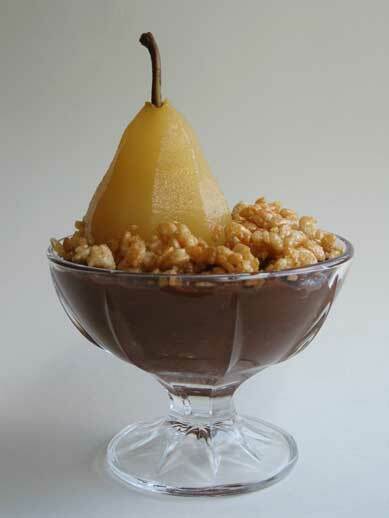 Here is the recipe for the poached pears. The chocolate rice pudding recipe can be found in Chocolate Desserts by Pierre Hermé. Pierre's chocolate rice pudding definitely did not disappoint. It was chocolatey, creamy, sweet - without being too sweet and comforting. Posted by Sam at 11:58 a.m. I swear it must be PH weekend. I have read so many posts where they made a PH recipe. Looks fabulous by the way. Perhaps I should drag out my PH cookbook and get on the bandwagon this week. Beautiful picture! And I'm sure that with a PH recipe it tastes just as good. It looks amazing and scrumptious! Thanks for all your lovely comments. PH rocks!